A veteran collector of cowboy gear, our contributor thinks he may have a saddle that once belonged to rodeo champion and Hollywood legend, Yakima Canutt. The saddle has the name "Canutt" tooled into the leather, with the word "Yak" inserted into the middle of "Canutt." Yakima Canutt dominated the rodeo circuit and when early Western actor Tom Mix met Canutt, he helped launch Canutt’s Hollywood career. Canutt first starred as an actor in silent movies, then doubled as a stuntman for some of Hollywood’s biggest names – Errol Flynn, Clark Gable and John Wayne. 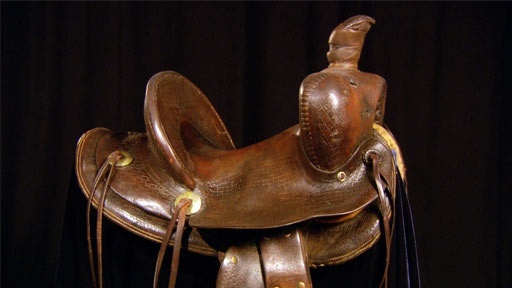 But our collector wants History Detectives to answer a nagging question: Did this saddle actually belong to Yakima Canutt? Also in Emerging Modern America: 1890-1930 Lindbergh Engine Could a 24-year-old have single-handedly built the engine for Lindbergh's plane? Also with Wes Cowan Manhattan Project Patent Was this drawing part of America's secret plans to fuel the atomic bomb? Also with Wes Cowan Slave Banjo Is this the only surviving banjo carried by former slaves following Emancipation?